The best ever roasted broccoli with garlic will become a staple for weeknights as well as your holiday table. Broccoli is quickly roasted under the broiler with lemon and garlic making crispy, crunchy, sweet broccoli that even those who swear they hate the vegetable will fall for. This broccoli side dish for Thanksgiving will please the whole family and only takes a few minutes to make. Since you’ll want to serve quickly after it gets from the oven, you can quickly broil while resting and slicing your main dish. It might come as a surprise, but I was a vegetarian for about 10 years. A half thought rebellion in the face of my parents divorce (yes, I tell them weekly that they are lucky that my only form of teenage rebellion in the face of divorce was going vegetarian.) I stuck to it into my 20’s. Okay, it didn’t hurt that my idol from one of my favorite bands was also a vegetarian.. This post was originally posted on Nov 9, 2016 and has since been updated. Since no one else in my family was a vegetarian, my parents were often in the position of needing to make something ‘special’ for me – God bless them. But more often than not, I was okay with salad, noodles, and a veggie side. 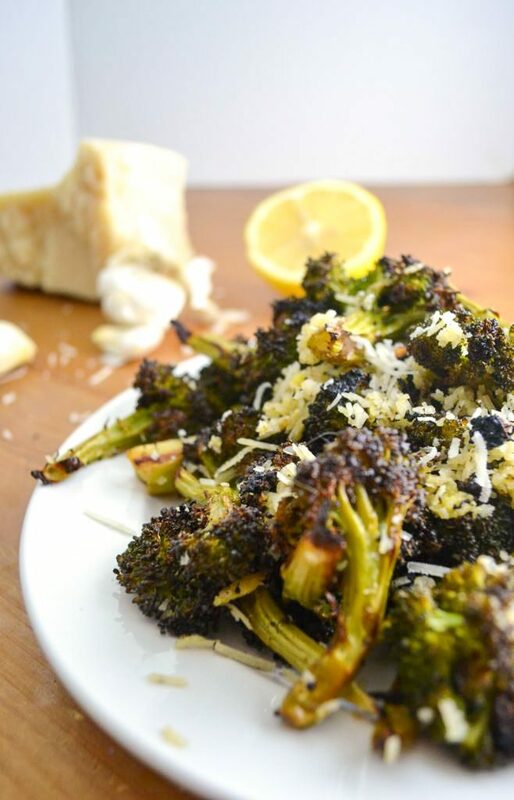 My favorite was always this roasted broccoli with garlic my mom made – she cooked it super hot with a generous amount of oil so the edge got crispy, topped with with lots of lemon and Parmesan cheese to make a vegetable side that could easily be subbed in for a meal. 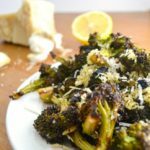 This roasted broccoli with garlic became such a loved veggie dish in my family, that any year we were going to my dad’s for Thanksgiving, my brother would get the recipe and try it himself. It’s the perfect broccoli side for Thanksgiving – you can toss it in after you take out the turkey, and cook the broccoli while it rests and you cut it. Okay, so I get it – maybe broccoli seems a little underwhelming. 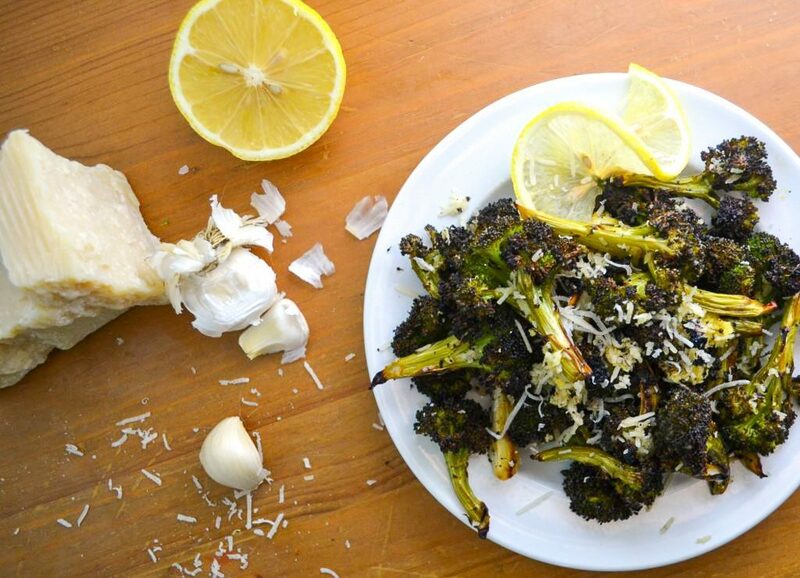 But i swear to you – this is the best ever roasted broccoli with garlic recipe you’ll ever find. Ever. It’s the only broccoli recipe you’ll ever need in your life, seriously. It’s slightly crispy, perfectly tender, and an explosion of flavor. 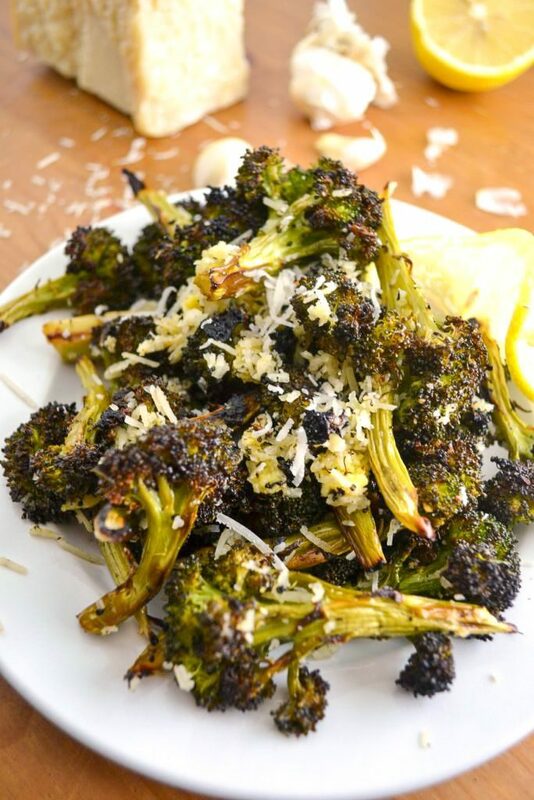 The broccoli gets slightly sweet in the oven with the garlic, the lemon adds in the perfect about of tang, and a little Parmesan offers saltiness and general deliciousness. The recipe doubles very well, just make sure that when laying on the baking sheet you don’t overlap or else your broccoli will steam and not get crispy, which is key to the most delicious broccoli you’ve ever had in your life. Start with a super hot oven – make sure your broiler is preheated. Make sure your broccoli is dry before adding the dressing. When cutting, I usually just cut each little ‘tree’ off and cut the rest to about the same size. I also usually cut the center of the talk into large sticks about the same size but that’s my own preference. Use real, fresh Parmesan. Bonus points if you grate it yourself, but make sure you at least get it from the specialty cheese section of your grocery store. This is a roasted broccoli recipe you won’t regret making – your family will beg for it year after year. It’s the kind of recipe that even someone who hates broccoli will love – I would know, my own husband is a converted broccoli hater! Preheat your oven by turning the broiler on high. Grate garlic and chop it very fine. Combine garlic, oil, juice of the lemon, salt and pepper before combining with the broccoli. Rub the dressing into the broccoli well. Lay in a single layer on a baking sheet and place on the center rack of your oven. Broil for 10 minutes before removing to quickly stir. Return to broil for about 5 minutes and remove. Toss with 2-3 tablespoons of freshly grated Parmesan and 1 teaspoon of lemon zest before serving. Okay, so tell me – roasted broccoli? Do you dig it? Doyou ever ruin your dinner by eating way to much an hour before? (please tell me it’s not just me.) Muffins for breakfast : a huge joke? Let me know in the comments! I challenge you to find something (savory) that wouldn’t taste better with that combo added! This sounds great–i love broccoli! I’ve definitely had too hearty of a snack after work and then not been hungry for dinner…oh well! I’m always just lazy/stuck in my ways and steam my broccoli, but this would be a delicious treat. I can definitely see myself going through a whole pan when I would have expected to have leftovers. Vegetables shrink when their roasted…. its not our fault. And muffins for breakfast? Absolutely no joke. Almost a daily occurrence here. Off to check that recipe. Thank you for sharing your last picture… Real life is that not all food always looks good on camera, but I’m sure it tastes REALLY good. I love love roasted broccoli. 🙂 And I need to check out your pumpkin cookie dough muffins. YUM! Oh I love the broccoli, lemon, garlic, and parm combo! This is most definitely the BEST roasted broccoli! And it doesn’t happen too often but I absolutely hate it when I ruin my dinner, because it’s my favorite meal! Yess! I mean, lemon, garlic and parm is good in just about everything but on broccoli it’s so, so good. I know what you mean – I was kind of bummed ot not eat an actual big dinner! Some people prefer a big lunch or breakfast but I’m pretty traditional in my dinner love. That roasted broccoli looks delicious! Actually all your food looks good. I think I need some sort of pumpkin muffin in my life as well. And they’re totally okay to eat for breakfast. It’s one of my favorite sides – even my husband who is very anti-vegetables digs it! Wonderful recipe! I love simple, healthy sides. 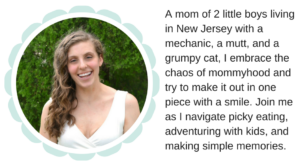 Thanks for sharing, pinning for later! It’s so simple and so tasty! It is! We’ve had it at many Thanksgivings! Yum! Roasting makes everything taste so much more flavorful and delicious. I love this idea. Thanks! yes! It’s my favorite thing to do with extra veggies. We really love roasted vegetables, thanks so much for sharing your delicious Roasted Broccoli with Full Plate Thursday this week. Have a great day and come back to see us real soon! Roasted veggies are such an easy side and a great way to gt rid of an abundance of veggies! I have actually never roasted brocolli before- now I need to try it! It’s seriously so tasty and EASY! Yum! I’m definitely going to have to try this out. I love broccoli, but have never roasted it. Thanks for the recipe! It’s so good! It’s one of my favorite roasted veggies.